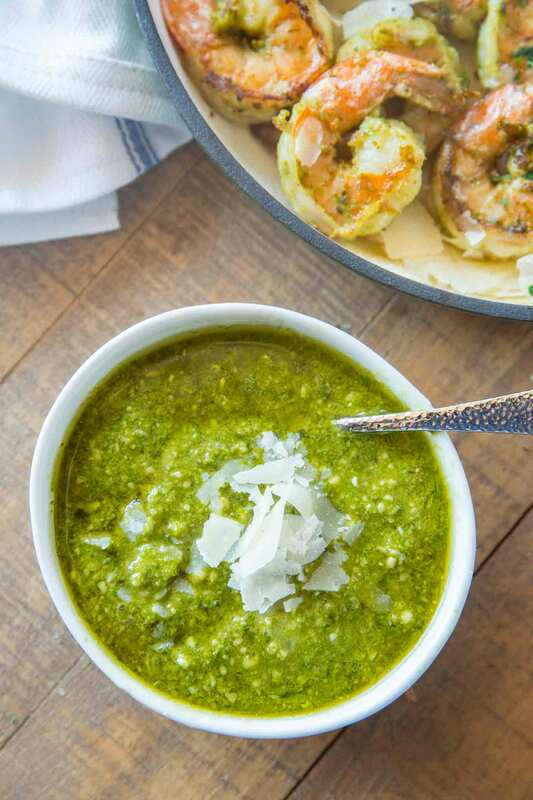 Basil Pesto made with toasted pine nuts, basil, garlic, Parmesan cheese and olive oil in just two minutes and perfect for making ahead and freezing for later. 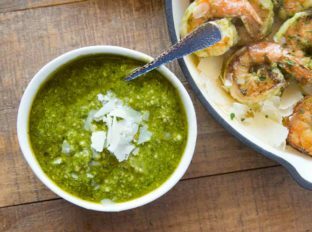 Basil Pesto is perfect for a quick pasta dinner, Pesto Shrimp or even a quick appetizer with crostini, ricotta and balsamic glaze! Pesto is such an easy “recipe” it almost doesn’t even qualify as one in my book. When I would cook for clients I never use a recipe for pesto, just more of an eyeball the ingredients until it looks like it works and add a bit extra olive oil along with any other ingredients like meat or chicken or pasta. Using pesto with pasta. It’s really important that you don’t rinse your pasta before adding the pesto to it. The added water to the pasta would not mix with the olive oil in the pesto. 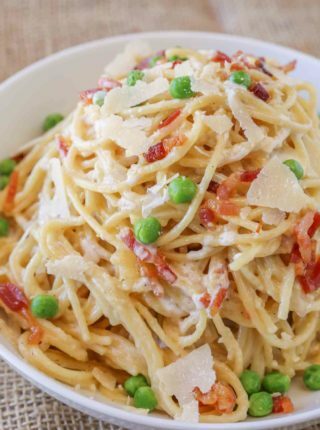 Top the pasta with additional Parmesan and even additional toasted pine nuts before serving. One of my favorite pasta mix-ins with pesto is Roasted Garlic Tomatoes. Add in some fresh mozzarella too and you’ve got a great dinner or served cold a great pasta salad! Pesto is made with olive oil, pine nuts, garlic and parmesan cheese with lots of fresh basil. WHAT TO SERVE WITH PESTO? 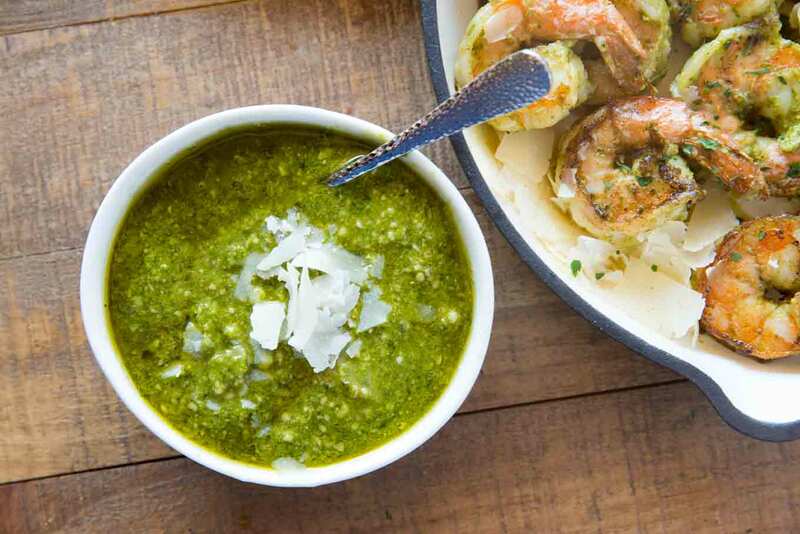 We love enjoying this pesto served with our favorite proteins like shrimp, chicken, salmon or pork with Garlic Bread, Olive Garden Italian Salad, and Rainbow Roasted Vegetables. 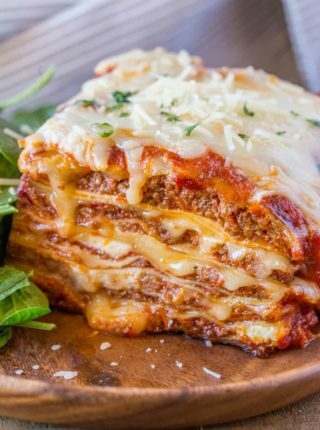 Add to pizza instead of Marinara Sauce or even just drizzle on top of classic pizza recipes. Add to cream cheese or ricotta cheese as a dip. Use as a spread on your favorite sandwiches. Add to an omelette or even top your Eggs Benedict with it instead of hollandaise. 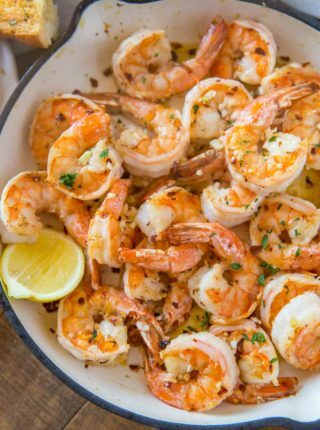 Add to roasted vegetables or any of your favorite grilled meats. Add to bread as a dipping sauce or instead of butter. 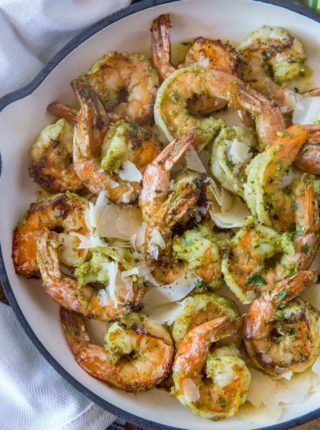 YES, Add the pesto with a bit more olive oil over it in a silicone ice cube tray or in a large ziploc bag and make sure you squeeze out all the air before closing the bag and freezing. When ready to cook just defrost fully before using. Try not to cook pesto for too long the flavor is in the freshness. Some people have allergies or aversions to pine nuts that are toasted and used in a classic pesto recipe. If you’d prefer to use walnuts just swap out the pine nuts for an equal amount of walnuts. I sometimes will also toast the walnuts before adding them to a recipe which doesn’t take long at all. Place the walnuts in a single layer on a cookie sheet and roast at 400 degrees for 5-7 minutes then let cool before adding to the pesto mixture (otherwise you will melt the parmesan cheese and wilt the basil). Basil Pesto made with toasted pine nuts, basil, garlic, Parmesan cheese and olive oil in just two minutes and perfect for making ahead using your summer crop of basil. Add the pine nuts to a small pan on medium heat and let toast until you can just smell the pine nuts.